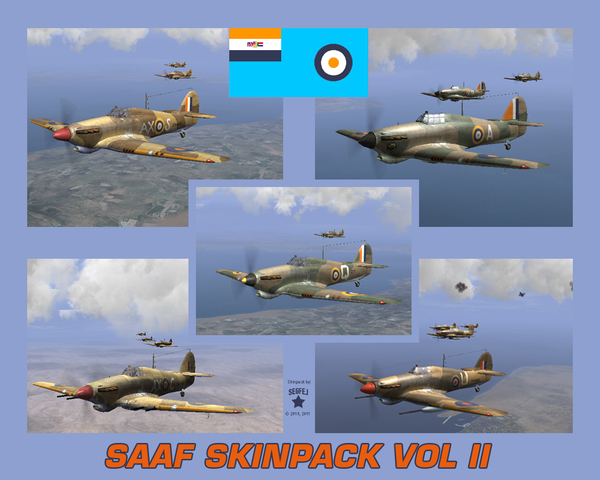 1 and a half Year ago I released my first SAAF Skinpack on M4T, it caused some people to point fingers at me for being Semi-Historical. Well, then those people will probably grind their teeth on this reworked Package. Took a hard toll, to find all the fractured Information and put this together. Not to tell you how much work it is, if you need to allocate both Hawker Serials, SAAF Serials and Tactical codes to get it historical. Skinners who did on this topic already mentioned the effort needed for such a project. Wiped the Semi out of Historical, I hope. Ladies and Gentlemen, Cheetahs and Springboks prepare for our 2nd Journey through SAAF WWII history. Thought I include a bit more, this Theatre being notoriosly untouched and SAAF Spitfires not availlable all the way, only some few. some of their respective Italian adversaries Fiat CR.42 Falcos and SIAI SM.79 Sparviero of the Regia Aeronautica. 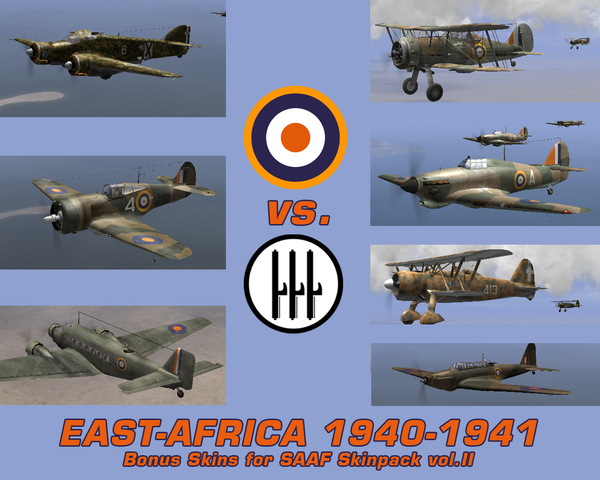 This Package includes also historical SAAF Spitfires for the new 3D Models of Mk. IX: http://www.sas1946.com/main/index.php/topic,18838.0.html and for Spitfire VbTrop: http://www.sas1946.com/main/index.php/topic,1615.0.html. For more accurancy please consider using these great Mods. Look brilliant mate, can't wait for these puppies ! There you have it, a bit more with my first ever released Spits, no prob since the new 3D Model makes Skinning easier. Thanks very much for these really beautiful skins - we in South Africa really appreciate your dedicated & skilled work.